it turns out they pretty much own the place. 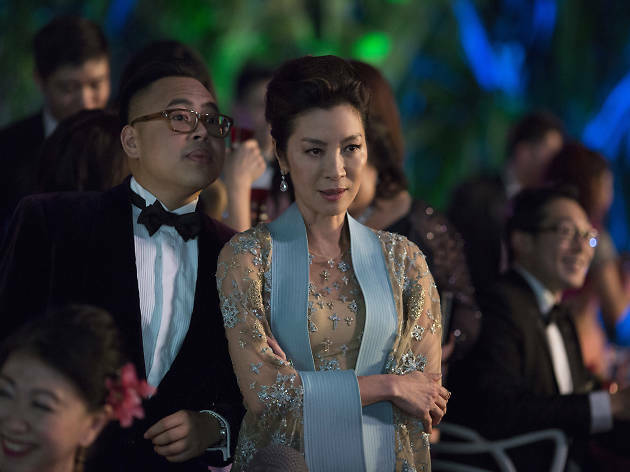 Cue unfeasible extravagance that somehow manages to feel inclusive: ‘Crazy Rich Asians’ is a VIP pass to the coolest parties in town. Beneath its glitz and glamour, the film has a familiar set-up: the story of two lovers from different walks of life who are willing to challenge tradition for their own happiness. But this always-engaging tale – the two leads bring real sincerity at the heart of the movie – is infused with a modern sense of money and personal reinvention. The gaudy flow of wealth is one of its many comic facets, never endorsed so much as offered up as passing eye candy. It has an edgier side too. For Rachel, the trip to Nick’s old turf for his best friend’s wedding becomes a psychological nightmare. A hen party brings out the pettiness in an ex. 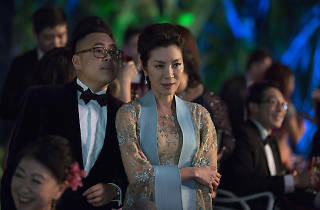 Even worse is a moment of confrontation between our heroine and the Young clan’s matriarch, Eleanor (Michelle Yeoh, formidable), who bluntly tells her she just isn’t good enough for her son. This is the first Hollywood movie with an all-Asian cast since ‘The Joy Luck Club’ 25 years ago, and that feels significant. Based on Kevin Kwan’s 2013 bestseller, it’s a celebration of diversity. It’s also filled with wholesome friends, mean girls and scheming parents, and loaded with cattiness – in the best way. Best of all, it’s filled with cultural nuances so rare at the multiplex. To hear your mum’s regional Chinese dialect in a major Hollywood film is an occasion for no small amount of pride. Crazy Rich Asians was my must-see movie of the year, and it didn't disappoint. An amusing script, family drama and beautiful people, all shot against the backdrop of beautiful Singapore: what more could you want? On re-watching the film, what I like most about it is the depth of feeling between the central couple. These are real relationships set against a tapestry of caricature, and I would argue that the central romantic plot is more genuine and heartfelt than many a Hollywood rom-com. This has a lot to do with the source material, and the film does well to translate the novel on-screen. My one gripe: whether through scripting or acting, Rachel Chu is more ditsy and has less agency than she appears to in the book - until the end, at least. For those who are unfamiliar with the novel, this won't mean much, but readers - prepare to be frustrated. There was a lot of hype for this show, especially in Asia (where friends overseas were all raving about it), so I was really eager to catch this one. And this didn't disappoint at all. It was everything I imagined and more!!! I almost want to call this a documentary as it really documents the lives of the rich and famous in South East Asia. Having gone to the same school as Kevin Kwan, it is not difficult to see the familiar stories and characters. I really applaud the show for not selling themselves out to Netflix and they are definitely enjoying the rewards as a result. The star-studded cast along with the very realistic story really makes this a must-watch and I recommend everyone (rich or not) to watch this! Thought the trailer was better than the film itself.. Mostly disappointed. Not a true reflection of Singapore or chinese ancestry; could have been filmed anywhere. I’m a sucker for rom coms Nd I wanted a night off from work and thinking. This movie ticked all the boxes! Light entertainment directors perfectly. It was a light hearted comedy and had the packed movie theatre in stitches. Everyone sitting around me loved it as much as I did! Bravo! Can’t wait for part two! One of the best films I have seen in a long time - I haven't laughed that much in a very long time! The cinema was packed - a true representation of how popular the film was! It was criticised for its casting choices and not reflecting multi-cultural Singapore, but in its defence how representative can a movie about the 0.0001% be? However, this film truly delivers through the many twists and turns. The casting is easy on the eye and a couple of the characters stand out with their comic turns. Some of the displays of opulence are truly eye-watering. I for one can not wait for the eagerly anticipated sequel. Crazy Rich Asians is a rom-com like no other. It is funny and romantic, both lead characters hold their own but still have a certain independence from each other that I think audiences might appreciate from a bang up to date love film. It is laugh out loud funny, from just the sheer stupidity of what these rich Asians get up to, (there is a wedding scene like no other.) The biggest draw has got to be Michelle Yeoh, best known for 007 Tomorrow Never Dies, but otherwise the rest of the cast are fairly unknown. It is nice to see that the whole Cinderella storyline transcends culture and class, and it doesn’t need any ‘big’ names but instead some modern day twists and flourishes for the bulk of the storyline to remain timeless. This isn’t a story that is going to have you on the edge of your seat, or even one that will be memorable in years to come, (having said that, who knows.) What it is, is a laugh a minute film that will surprise you, thrill you, and hopefully leave you talking about it long after the credits have rolled. This is a superbly photographed film, a pleasure to watch, well acted & totally entertaining. It's being sold as a chick-flick rom-com which is a very unfair description, if this was a typical chick-flick rom-com I'd go & see more of them. Everything the trailers and the hype made it out to be! The videography was simply stunning, the shots of Singapore were really great and it was so nice to see my home town on the big screen like that. It wasn't your typical rom-com, which was a nice change and now definitely makes me want to read the book. Definitely a must-see of this summer!